Richard Sefton's creativity did not end with the large bronze bust of Henry Freeman but with a limited edition figurine, he tells the captivating story below. My thoughts whilst working on my bronze of Henry Freeman, unveiled at the opening of the new Whitby Lifeboat Station on the 7th September 2007, have been made known on several occasions, via press, media etc. 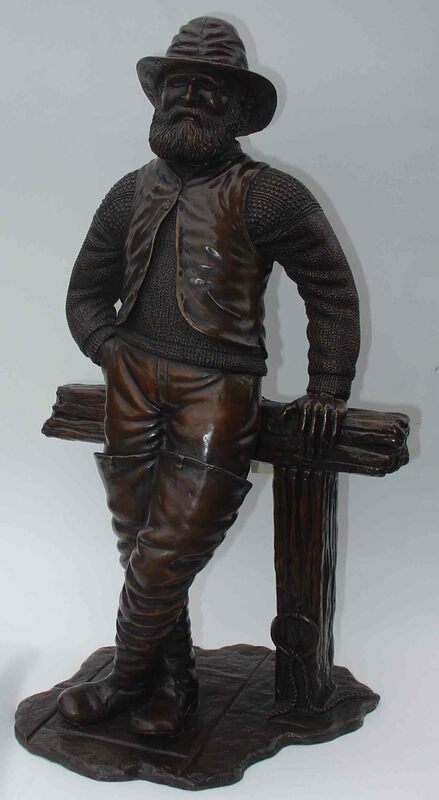 What is not widely known, is my follow on piece, a bronze figurine of Henry Freeman leaning against the rail of Whitby Harbour, simply as a fisherman, a classic pose. This piece came about when, after delivering my life size clay sculpture to the Foundry to be cast in bronze, my workroom seemed quite empty, after a period of saying good morning, and goodnight to Henry whilst working on the piece, it felt like we had lost a member of the family, there was now a big empty space where he had been for some months. By now I was so captivated by this great man, and having read just about everything written about him, I had the urge to take things a stage further, and so without a thought of where things might lead, I began working on the pre-mentioned standing figure. Given that the very idea of having a lifesize sculpture of Henry Freeman mounted on the sea facing wall of the new lifeboat station, was down to Coxswain Mike Russell from the very beginning, I knew that he would be interested in my follow up piece. On seeing the new sculpture in clay, Mike and several members of the lifeboat crew insisted that I return to the Foundry and have the piece cast in bronze. This was duly done. 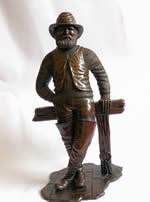 The bronze figure, simply known as 'Henry Freeman" was produced at Lunts Foundry, Birmingham, and is a limited edition of 69, the age of Henry Freeman at the time of his passing. It was very much my wish, and I am delighted to say, the wish of all concerned at the Whitby Station, from Coxswain Mike and crew, that the piece should be foundered in England, rather than the cheaper option of going abroad., (we all know where that means don't we?) It has been considered by all, to be a sculpture of an English man, by an English man, cast at an English Foundry, it is thought that this gives the piece the status the man deserves, rather than a cheaper foreign import. Richard Sefton, of Pickersleigh Grove, Malvern, received a formal invitation to fly to Washington to hand over a sculpture depicting a cowboy on horseback. 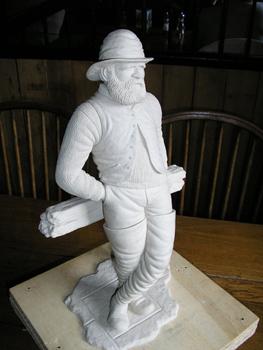 The piece, entitled Get Off My Buck, was first designed by Mr Sefton while he was working for the former porcelain company Connoisseur of Malvern. The moulds were recently resurrected and a series of 41, entitled Bronco Busters, commissioned. In December, a piece from the series was presented to George Bush senior, who decided that his son should also have one. Mr Sefton said: "The Bushes are a cowboy family, so it's very appropriate. But when I first did it, I had no idea it would end up in the White House. "I've got stuff in galleries and museums all over the world, but clearly this is a tremendous boost." 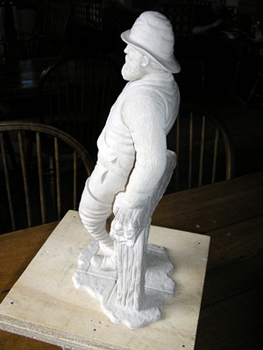 The sculpture for George W Bush was painted by Bronte Porcelain, of Malvern. Henry Freeman has died at the age of 72. Richard Sefton was asked to create the larger-than-life bronze bust of Henry Freeman, now displayed in the town’s lifeboat station. He said making the sculpture had given him more pleasure than any other he had done and he made no charge for it. 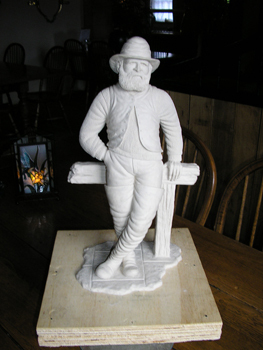 In the sculpture, Henry Freeman is depicted wearing his cork lifejacket. A prominent spokesman for the cause of lifeboat crews, he was the sole survivor of a shipping disaster in 1861. Mr Sefton, who died after a battle with cancer, exhibited and sold his work during his 30 years’ career as a sculptor all over the world. Another well-known piece was his model of Sefton, commissioned by the Household Cavalry, the famous cavalry horse severely injured by a terrorist bomb in London some years ago which became known as Sefton by Sefton. He was also particularly successful in America and presented one of his sculptures of a cowboy on horseback to president George W Bush. After training as an architect and working as a builder for many years Mr Sefton only turned his hand to sculpture by chance, while working for former porcelain company Connoisseur of Malvern.